There were so many interesting developments in 2018 and more to come this year. Here we take a look at what's happening in autonomous supply chains, omni-channel delivery, AI/machine learning, blockchain for supply chain, checkoutless stores, and self-sovereign ID. Autonomous Supply Chains—for ‘self-driving supply chains,’ the battle for market attention will start in earnest this year, even though several years of development are needed before getting to true chain-wide autonomous planning and execution. Omni-Channel Delivery—Omni-channel has been around for a while, but we expect lots of new developments in 2019 including innovations in delivery vehicles, delivery locations, and urban distribution infrastructure. AI/Machine Learning—Though AI/ML is in practically everything already, this is just the start. The areas of adoption in supply chain are many and growing. We cover many of these below such as AI/ML in forecasting, planning, automated classification, generative design, cognitive sourcing, predictive maintenance, chatbots, and many more. Blockchain for Supply Chain—People are beginning to understand the magnitude of the task of making blockchain technology work in multi-party supply chains. We cover applications and some of those challenges. 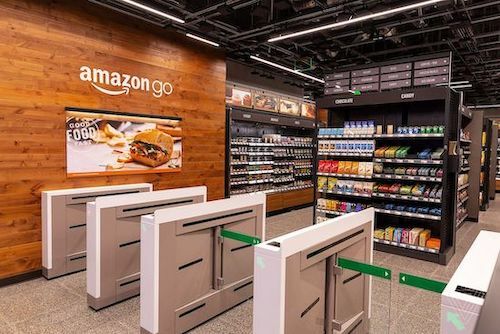 Checkoutless Stores—The expansion of Amazon Go is spurring other retailers to take this format seriously and a slew of new startups have emerged to help retailers get there. Self-Sovereign ID—Our current approach to ID management is broken. A year ago, we weren’t sure if SSID was going to be accepted quickly. Now it is looking a lot more promising. The idea behind autonomous supply chains (aka self-driving supply chain) is that supply chain systems will make most of the key decisions automatically without human intervention, leaving humans to deal with the exceptions or decisions requiring human judgement. This can happen in both supply chain planning and supply chain execution. We are already seeing autonomous planning as noted here from ToolsGroup and here from Logility. We expect the use of autonomous planning to expand significantly in 2019 as more companies become aware of it, and as those already using it become more comfortable and trusting of the recommendations the machines are making. Inventory tracking—near real-time visibility into inventory levels at manufacturing plants, distribution centers, warehouses, and retail outlets across the chain. Manufacturing status—visibility into the actual status of production at suppliers and a company’s own plants, including any delays or changes to plans. Predictive analytics—Predicting delays in production and logistics using data and signals such as raw materials shortages, equipment breakdowns, weather, port congestion, traffic, deviations from planned routes, strikes, civil unrest and breakout of conflicts, and so forth. Impact analysis and prioritization—Understanding the impact of various delays and prioritizing the ones that need attention. For example, if a truck is late leaving an overseas factory, but will still make the cutoff time for the planned ship loading, then no further action may be needed. Similarly, an order that is going to arrive late, but there is sufficient buffer stock to cover production or sales until it arrives, can also be ignored. For the subset of delays that will have an actual impact, the system may prioritize them based on the impact to revenue, profit, critical customer relationships, and other criteria of importance to the company. Resolution suggestions—Systems will be able to suggest potential resolutions and show side-by-side the expected impact of each different resolution. For example, expediting may enable earlier production, but at a higher logistics cost. But this will go beyond those kinds of simple tradeoffs. Using AI/ML and chain-wide data and awareness, systems will be able to find more creative solutions that humans might not be able to find (the proverbial needle in a haystack) thereby providing resolutions that reduce or eliminate the traditional tradeoffs. Automated execution—Once a planner/manager has decided which resolution to implement, they will be able to execute it with the click of a button. Behind the scenes, the autonomous supply chain solution will update all the relevant planning and execution systems. Full automation—With machine learning, the system will only get smarter over time. As users get more and more confident that the system is providing the best answers, time after time, they will be more willing to ‘hand over the reins.’ This will not happen all at once, but rather within constrained boundaries at first (specific types of problems, orders below a specific size, at least a minimum % confidence level in proposed resolution, etc.). We expect those boundaries will be tunable by the end user, based on their confidence in the system and appetite for risk. 2018 was a year of announcements (mostly about the future) and expositions on solution providers’ autonomous supply chain visions. JDA’s autonomous supply chain ‘moonshot’ was the headline at their Focus conference this year. Infor GT Nexus described their autonomous supply chain strategy with the announcement of their new ‘Control Center’ at this year’s Inforum, which I believe was underreported as an important new development. At the recent E2Open Leaders' Forum, E2Open described their Control Tower, which includes impact analysis, prioritization, and resolution enablement—all steps towards an autonomous supply chain. Regarding in-network optimization, One Network appears to be the furthest along with the launch of their Global Logistic Gateway last year. We expect 2019 to be the year that marketing battles over autonomous supply chain capabilities begin in earnest. While marketeers love to borrow buzzwords from one another (often obfuscating the differences between them), the major players are coming at this from very different starting points, and with very different strengths and weaknesses. So, 2019 will be a year when end users are trying to sort out the various claims and messages about autonomous supply chain capabilities. The more adventurous end user firms will begin to experiment with the technology and work with solution providers to provide input into roadmaps. While autonomous planning (in silos) is available today, true chain-wide autonomous execution capabilities will take a few more years before it’s ready for prime time. Autonomous delivery is in the sights of Amazon and many others. 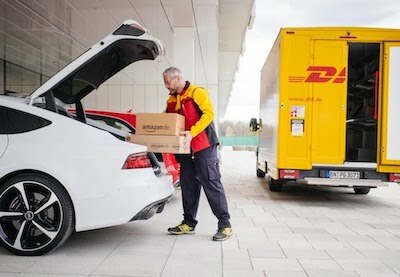 Last year, Amazon filed a patent for ‘autonomous ground vehicles’ (AGV), which are not owned by the delivery company, but rather by the property owners (i.e. home, apartment, condo, or business owner). The AGVs would drive out to the delivery truck when it arrives, be loaded with the order, and drive back to their delivery location, potentially with the ability to open a garage door or locked front door of a house. 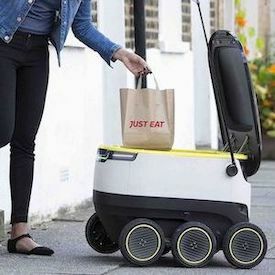 In June, Robby Technologies introduced their second generation delivery robot, with improvements based on about 3,000 miles of testing from their first generation. They are partnering with grocery and restaurant food delivery startups such as Instacart, Postmates, and DoorDash. Starship Technologies has a six-wheeled delivery robot that has been tested in over 100 cities. They have raised over $42M in venture money, including a $25M round last June. In November, they launched a delivery service in Milton Keynes,2 UK (near London). There are many more delivery robot startups besides the ones listed above—here’s an article listing 11 different companies working on delivery robot and a new walking robot called Cassie from OSU. These will have to overcome technical issues (e.g. robots catching on fire) and social acceptance issues (such as people kicking them or cities banning them). In addition, DoorDash and GM just announced they plan to test unmanned food and grocery delivery, using GM’s driverless cars. Expect many more of these types of partnerships. Lyft tested driverless ride-hailing services with a fleet of 30 driverless BMWs in Las Vegas last year and acquired Blue Vision Labs in October. Delivery drones also made progress in 2018 (Flytrex expanded its drone delivery service to cover about half of Iceland),3 but faces some daunting additional obstacles that are likely to take longer to resolve in the rest of the world. First and foremost is regulation of airspace and valid safety concerns. Absent a crisis, regulatory bodies are not known for moving fast. The approval process is impacted by an increasing number of rogue drone incidents shutting down airports, getting too close to aircraft in flight, and invading people’s privacy. There are also safety issues with drones falling when their battery dies. Current drones are quite noisy with an annoying whine that can be particularly disturbing. Furthermore, delivery by drone will require flying ‘BVLOS’ (beyond visual line of site), which requires collision avoidance mechanisms that regulators will likely need to create test and certification regimes for. 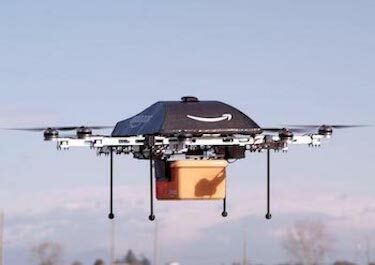 Taken all together, this means delivery by drone will likely not happen on a mass scale in 2019 or even 2020. We expect to see pockets of testing and staged rollouts, working out the kinks over the next five to ten years. All this delivery innovation is for naught if the basic distribution infrastructure remains the same, with large central warehouses. Brick and mortar retailers are getting better at figuring out the role of their stores as fulfillment centers. This requires the merging of demand, inventory, and logistic intelligence, to understand where items should be forward positioned for the optimal cost and customer experience. Crowded cities in Europe and Asia have been using multi-story urban warehouses for a while. 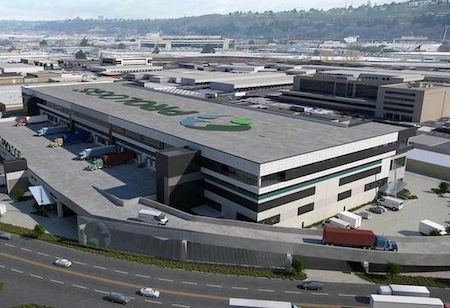 2018 saw the first multi-story urban warehouse in the US, with more to come this year. We also see continued uptake in the use of advanced pool distribution as a viable way to provide more points of distribution for retailers via shared distribution centers and logistical resources. Retailers and etailers will continue to seek economical innovations to forward-position goods near the expected points of demand, as customer expectations for delivery times continue to shrink from days to hours to even minutes. AI has been around for over 50 years, yet it is only in the past five years or so that we’ve witnessed dramatic adoption, not just in supply chain but across almost all domains. This recent surge in adoption has been unleashed by three factors: 1) the emergence of massive on-demand computing power,6 2) better algorithms, 3) more data. The data explosion may be the most important piece of the equation. The internet creates an explosively growing aggregation of extremely diverse data, including a huge and varied amount of social network data. For supply chain, the data locked up in enterprises is even more critical, but still highly fragmented. The emergence and growth of multi-party supply chain networks, especially those with high volumes of historical data, will be one of the drivers of AI/ML in the supply chain. As companies digitize their operations (i.e. moving from manual/paper-based processes) and instrument their processes (implementing sensors and cameras throughout), a lot of relevant data is generate from which value can be unlocked using AI/ML, especially when combined with the increasing availability of external digitized data, such as weather, economics, movement of assets, news feeds, social data, etc. 2019 will be a big year for Artificial Intelligence and Machine Learning (AI/ML) in Supply Chain. AI/ML already is being used by virtually every supply chain solution provider we work with, for an enormous variety of purposes. ERP vendors are also implementing AI/ML in a big way, including more recently in the mid-market. At last year’s SuiteWorld, NetSuite discussed their intention to roll out AI/ML across their suite; SYSPRO is implementing AI and IoT; and perhaps furthest along, Infor has gone all in with their Coleman AI software as the basis for their strategy to combine human and machine intelligence, as well as their ML-driven Talent Science capabilities . We’re only just at the beginning of seeing the full impact of AI/ML. The past five plus years have been a period of solution providers figuring out where to apply AI. The next five years will be a period of intense exploration and adoption by enterprises and governments, figuring out and implementing the best ways to best use these technologies. They will leverage the fruits of digital transformation efforts, which have made huge amounts of data available to drive AI/ML engines. We expect 2019 will bring more awareness of the ethical impacts of AI/ML. Some organizations will begin in earnest to try to implement AI/ML more responsibly—in ways that avoid systemic bias, support their corporate values, and provide help and retraining for displaced workers. While AI/ML will eliminate some jobs and create new ones, it will have a far broader impact on changing the nature of most existing jobs. In particular, a lot of rote grunt work will go away. People will focus more on the tasks that humans are better at than machines, with increasingly smart tools and digital assistants to help them. 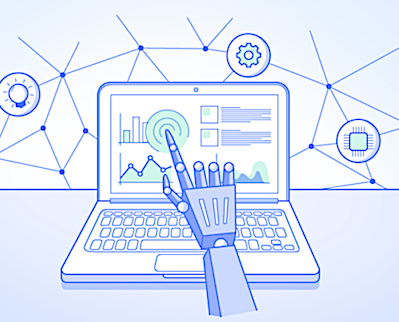 Forecasting and Demand Management—In forecasting and demand sensing, machine learning is being used to improve on traditional forecast algorithms by companies like Terra Technologies/E2Open and ToolsGroup (launched ML tools in 2011). ML is able to incorporate a much wider range of casual factors and data than many traditional forecasting algorithms. Planning and Optimization—Logility/Halo uses machine learning for algorithmic planning and sensing important events to present to the user in context. Logility refers to this as Cognitive Planning. ToolsGroup has been building out AI/ML-driven autonomous supply chain planning capabilities for over half a decade. They already have some customers who have 100% of their planning done automatically. Checkoutless Stores (i.e. Amazon Go and Brethren)—ML is the core of the ‘articulated pose recognition’ required for keeping track of which shopper is picking up which item. More on checkoutless stores below. Intelligent Integrated Stores—Checkoutless stores are part of a broader and older trend of instrumenting7 retail stores—i.e. putting various sensors, measuring devices, and feedback/control mechanisms in the store—and more recently feeding all that data into AI/ML platforms to create Intelligent Integrated Stores. 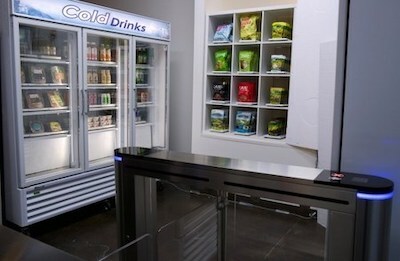 Examples include Zebra’s SmartSense for Retail and Tyco Retail Solutions. Document Recognition/Digitization—Machine Learning can help companies go fully digital by super-charging OCR and other document-recognition technologies. For example, towards their vision of an ‘expense report that writes itself,’ Concur uses ML to recognize and digitize receipts from pictures of those receipts taken by employees. Tradeshift uses ML to digitize invoices that may be received in a variety of proprietary formats, such as via fax or as a .PDF. Automated Classification—SAP Ariba has developed ML-based automatic classification of purchased items, materials, and services. Generative Design—Generative design lets a design engineer define the parameters and constraints (e.g. size/space envelope, mounting/connection points, weight, strength, types of materials, manufacturing methods, and cost) for a part they need and then uses machine learning to generate hundreds or thousands of different possible designs, trying to find the ones that most closely fit the objectives given. The engineer can then filter and select the best design(s) for their purpose. 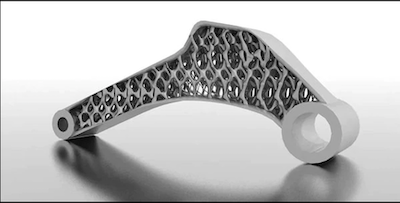 Autodesk has productized their generative design from Project Dreamcatcher and PTC recently acquired Frustum. Cognitive Sourcing—LevaData’s platform uses AI and machine learning to provide automated market intelligence and identify opportunities (see ‘About LevaData’ sidebar here), based on internal company information (such as the forecast, BOMs, materials master data, and other master data) and external data (such as news feeds, weather, commodity indices, economic data, etc.). The algorithms provide specific recommendations for sourcing and negotiation strategies as well as sophisticated ‘should-cost’ analysis. Merchandising and Assortment Planning/Customer Segmentation—Customer segmentation in retail (used for store clustering, merchandising planning, etc.) is traditionally based on customer demographics. Machine Learning is being used to create segmentation based on the customer’s actual buying behavior (aka persona clustering), as done in JDA’s Luminate Assortment (formerly Retail.me). 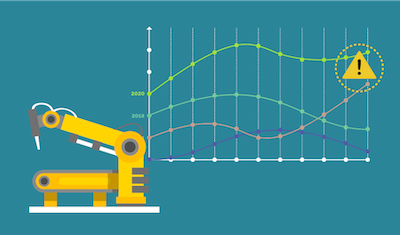 Predictive Maintenance—Using sensor data and other data, ML can predict failures before they happen, thereby simultaneously lowering maintenance costs and downtime. Here we discuss the role of predictive maintenance in smart grids. PTC has invested heavily in IoT technology, enabling digital twins, and uses their ThingWorx platform to provide predictive maintenance via their ColdLight acquisition (renamed ThingWorx Machine Learning). Predictive Logistics—Dynamic Precise ETA are calculated by ML algorithms that consider various factors (vessel/vehicle speed/location, weather, port congestion, traffic, backlogs, events on the ground, etc.) to provide a much more precise estimated time of arrival. Examples include capabilities from GT Nexus and TransVoyant (part of their ‘Precise Predictive Logistics’). Predictive/Autonomous Supply Chains—The concept of predictive logistics can be broadened to a predictive supply chain. This encompasses a supply chain-wide view of inventory, logistics, and manufacturing, to provide early warning into delays. Autonomous supply chains take it a step further and focus attention on the highest impact issues, providing suggested solutions. AI/ML are core to making autonomous supply chains work. If interested, autonomous supply chains were covered in more detail earlier in this article. Dynamic Shelf-life—Zest Labs tracks the temperature history of pallets of produce and feeds that into machine learning algorithms to dynamically adjust the actual remaining shelf life of produce as it is exposed to different temperatures. Chatbots/Natural Language UI/Personal Assistants—Progress has been slow on natural language interfaces for supply chain applications, but the pace is picking up. The broader use of voice-activated personal assistants such as Alexa, Siri, Google Assistant, and Cortana has fueled the appetite for similar capabilities in enterprise systems, while also helping users understand the limitations of these assistants. General purpose AI-based ‘concierge services,’ where you can ask for help on just about anything, is still far away, but more narrow skill-driven approaches are here today. Some businesses, such as Infor with their Coleman Digital Assistant, are leveraging Amazon’s Alexa for Business platform to create skills-driven functionality for enterprise users, which can be extended via Infor’s ‘citizen developer environment.’ We expect 2019 to see increased rollout of these kinds of ‘assistant’ solutions, including more automation of help-desk functions. This is by no means an exhaustive list, even if we are just talking about the use of AI/ML in supply chain-related applications. For additional thoughts on AI and robotics, see Thinking Machines. Supply chain has been touted as one of the prime applications of blockchain technology (here we are referring to distributed ledger capabilities, not standalone cryptocurrencies). In particular, blockchain can be useful where there are unknown trading partners and lack of trust; where many parties need to coordinate around shared visibility and a single-version-of-the-truth; where there is a need to prove authenticity and ownership; where multiple serial steps of paperwork slow things down; and where auditability is important, and fraud is an issue. So, supply chain seems to be a good fit for blockchain, with target applications including chain-of-custody tracking, traceability, anticounterfeiting, provenance, global trade enablement, trade finance, spot markets, sustainability/CSR, cargo security, asset tracking, Know-Your-Customer, and more. What is less talked about are the challenges that need to be overcome to make these all work in a true multi-party supply chain setting. These include: Creating and maintaining multi-enterprise canonical data models (immutability of data adds a twist to evolving these …); Create and maintain/evolve shared multi-enterprise processes across multi-stakeholders; Develop multi-enterprise fine-grained security architecture and admin tools; Data veracity checking mechanisms and algorithms/data cleansing, training AI/ML algorithms on large, global, broadly representative, multi-year or multi-decade data sets; Integration with off-chain system, other networks and (eventually) other blockchains; Developing business and revenue models that work; Developing incentives for network participation that work; Creating a network effect—build out a meaningful network of participating companies; and Governance mechanisms for developing/refining shared identity proofing policies. That is a lot of work to do. We’ve seen lots of white papers and proof-of-concepts, a few pilots, and even fewer product announcements. We expect blockchains will become quite important for supply chains, but it will take the better part of a decade before we see widescale adoption. We think 2018 may have been the peak of hype for blockchain in supply chain. However, now is when the real work begins. We expect continued investment and progress in 2019, as the maturing process begins in earnest. There will be more startups emerging, but also failures of underfunded and/or misguided efforts. For those unfamiliar with Amazon Go, it is a checkoutless store. Once you’ve downloaded the Amazon Go app, you can use your phone to enter the store (it scans a unique barcode on your phone). Then you simply pick up any items you want and walk out of the store; no checkout needed. Your Amazon account is automatically billed for the items you took. For more details on how it works, see this article we published last April. When Amazon Go was announced in December of 2016, they said it would open to the public in ‘early 2017.’ We were rightfully skeptical of that date (it took until January of 2018). However, the announcement kicked off a bevy of competitors’ announcements in 2017. Frustrated with the lack of any in-depth articles on how it worked, we did our own research, and in April last year published Amazon Go and the Emergence of Sentient Buildings: How It Works and What Its Impact Will Be, including detailed pictures of the store and hardware involved, a discussion of the amazing deep learning algorithms that make it all work, and some thoughts on the economics and impact on broader retail. Standard Cognition—Raised $40M in June last year (on top of $11M raised earlier). Standard Cognition has four chains trying out their technology (grocery, drug, and convenience stores in the US, and Japanese Pharmacy Yakuodo). They use ceiling-mounted cameras (without the shelf-mounted cameras that Amazon Go uses) and they are aiming to outfit much larger stores, up to 20K square feet or more. They already have a demonstration store in San Francisco, open to the public since September. They claim 99% accuracy. Grabango—Just raised $12M in an A round of funding, and unlike Amazon Go and other solutions, Grabango does not require an entry gate—shoppers simply enter the store and start taking items. When done, they can pay at a cashier (no scanning required) or by smartphone. They use cameras and sensors. Zippin—Opened a beta store in September (in San Francisco, where else). They require shoppers to scan-in to the store (like most others) and require shoppers to scan out as well. Inokyo—Opened a checkoutless store for beta testing in Mt. View last year. They use overhead and on-shelf cameras. Trigo Vision—This Israeli startup is providing checkoutless technology to Shufersal, Israel’s largest supermarket chain. They are claiming 99.5% accuracy. Trigo offers either a checkoutless experience, or self-checkout at a screen (but with no scanning of products required). They are working with two other international chains and sources. One source quoted a cost of between $20K - $30K per store, much less than the cost of outfitting an Amazon Go store. In July, they raised $7M in seed funding. AiFi—In February 2018, they announced “the first scalable checkout-free solution for stores.” They claim to be able to use a store’s existing security cameras (we are skeptical), combined with ‘sensors and fixtures’ (not clear what type) and AI. In June, they said they will be conducting pilots, though we haven’t seen any further news about those yet. DeepMagic—Founded by Bernd Schoner8 and Davi Geiger, DeepMagic offers a checkoutless pop-up kiosk/store, initially in an 8’ X 7’ format. Instead of throwing a ton of hardware at the problem (as Amazon Go does), DeepMagic uses only a few cameras, combined with AI/ML, remote monitoring, and efficient exception handling. Watasale—India-based retailer has developed their own technology. In September last year, they opened their first store in Cochin City in Kerala, India. They hope to expand to more stores in India and eventually internationally. They also would like to expand beyond grocery to also do pharmaceuticals. IMAGR—New Zealand-based company takes a different approach, using sensors on the shopping cart or basket to see what the shopper has taken. IMAGR was trialed at a Four Square store in New Zealand in February of last year. Focal Systems—Another cart-mounted camera, but this does double duty, using two cameras. One points at shelves to detect out-of-stocks and alert store associates that an item needs restocking; the other points across the cart to detect what items the user puts in or takes out of the cart. We wrote about them in more detail in a previous article. Everseen—Based in Ireland, they were originally aiming at loss prevention but have since shifted to checkoutless. We also wrote about them earlier. Aipoly—It appears they only need cameras, not sensors, to retrofit an existing store. They also have an application to let visually impaired people identify products, which was their original target market. It is unclear how much money they’ve raised or what kind of traction they are getting. Walmart—In October, Sam’s Club launched their new “Sam’s Club Now” app. This may be in response to Amazon Go, but it requires the consumer to scan each item with their phone. While that may appeal to some shoppers, it does not have the same convenience as true Amazon Go-style checkoutless. As you can see, this is a crowded field. Some of these firms are more well-funded than others. We expect activity in this space to accelerate in 2019. It will be a year of more trials and shaking out the differences between these platforms, both in technology and business model. Some of these solutions use sensors and others do not. If they require a scale on each shelf, that could start to add up costs quickly. It may turn out there is room for several different approaches to address different needs and different store formats and sizes. One thing is for sure, most retailers cannot afford the huge price tag of the Amazon Go approach (by some estimates $1M per store for the hardware). Current standard approaches to managing identity are broken on a couple dimensions. First is the reliance on shared secrets, like passwords, credit card numbers, mother’s maiden name, social security number and so forth. These create large and tempting honeypots of data for thieves to steal at the websites of institutions that hold this data. And we have seen plenty of breaches, with more to come. A much better approach is the use of multi-factor authentication with biometrics (we wrote about FIDO, biometrics, and TEEs last year). A fundamental problem with the current approach is the fact that we don’t control our own identity. Our identity is controlled by the array of institutes that we deal with, starting with the hospital we are born at (for our birth certificate), the schools we go to (student ID), the DMV (drivers license), banks where we have accounts (bank cards), and so on. That information can end up in all kinds of places that we don’t want it to. 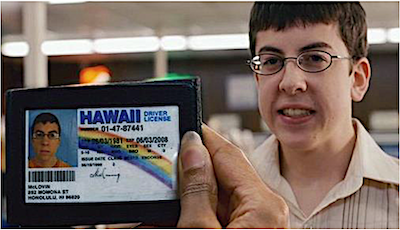 With self-sovereign ID, a person has control over their own ID and information. In particular, verifiable claims allow zero knowledge proofs of assertions we make. For example, currently if we want to buy liquor at a store, we have to hand over our license, which reveals all kinds of personal information: our street address, exact birth date, license number, and more. With verifiable claims, we can simply use our phone to send an electronic assertion that “I am over 18 years old.” The verifier can reliably check this assertion with a trusted party, such as the DMV, who will simply tell them whether your assertion is true or not. Biometrics, cryptography, and digital signatures/PKI are used in combination to provide a very high degree of confidence in the answer … in fact much higher confidence than traditional identity documents, which can be forged. The same approach can be used for asserting that you have a particular degree from a specific school, or that you are a resident of a certain city or state, or that you have a valid license or certification, and so on. If interested in more details, see A gentle introduction to self-sovereign identity. A number of technical standards have been developed for SSID and verifiable claims.9 In addition, a number of SSID organizations have arisen, such as Sovrin, uPort, Civic, SelfKey, ShoCard, Tieron, and Peer Mountain. Most of these belong to the Decentralized Identity Foundation (DIF). A couple of years ago, it was unclear whether governments, banks, and others would embrace SSID. In last year’s January issue, we identified Self-Sovereign ID as an area to watch. At that time, we weren’t sure whether or how quickly this technology would gain traction. It turned out 2018 was quite a year for SSID. We are starting to see meaningful activity, particularly with Sovrin. For example, the government of British Columbia has registered over 500K active legal entities and issued over 1.4M permits and certificates on their Sovrin-based Verifiable Organizations Network. 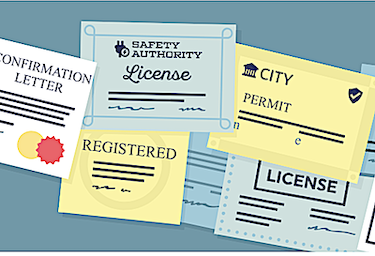 These allow a business to electronically prove that they have the required permits and certificates for running a business or completing a project (such as building or modifying a house). CULedger, also on the Sovrin blockchain, is a consortium of credit unions providing SSIDs to members with the stated goals of “reducing risks associated with cybersecurity and fraud, improving the member experience, streamlining internal processes and reducing administrative and operational costs.” One source told us that CULedger is aiming to have over a million people using MyCUID by the end of 2019. Alberta-based ATB Financial is working with Sovrin to provide SSIDs to their members as well. Barclay’s Bank is working with Evernym to provide Sovrin-based exchange of instantly verifiable digital credentials, including payment, to power checkoutless retail. So, we are starting to see some real movement and real-world implementations of SSID, by banks and governments. We expect these will accelerate in 2019, as more people become aware of the advantages this technology can provide to all parties involved. One thing that will be key to adoption is a super-easy user experience. We believe a highly intuitive UX, that makes life easier for users, will be a key factor in determining which of these projects succeed. There are several other areas we would have liked to cover and will likely touch on in future issues. One area that we believe will receive a lot of attention this year is augmented reality, which has some high-value applications in manufacturing, service, and other supply chain-related areas (for example see what PTC is doing). Further down the road (perhaps in a decade or so), we think there is a good chance that augmented reality glasses may replace most smart phones. The concept of the AR Cloud is very compelling as well. In the words of Ori Inbar, who coined the phrase, AR Cloud is “a persistent 3D digital copy of the real world to enable sharing of AR experiences across multiple users and devices.” (see The AR Cloud will infuse meaning into every object in the real world). Last October, Lyft acquired AR Cloud company Blue Vision Labs, to help with its self-driving car effort. Blue Vision ingests millions of images of a metropolitan area from cellphones to create a highly detailed 3D map of all the fixed structures in the city. This allows any camera to achieve centimeter-accuracy locating capabilities (that’s 100 to 1,000 times more accurate than GPS; no wonder this is attractive to Lyft). But it also would allow all kinds of intelligence to be embedded in the objects around the city. We could do a whole article on this. Other areas we would have liked to cover include Industrie 4.0/Factory of the Future (see X-Factory for more on this), IoT (including advances in smart factories, logistics, smart cities, precision agriculture, smart mines, and more), and autonomous vehicles, where there is so much going on that will impact supply chains, especially in the area of autonomous trucks, trains, and ships. We expect to see incremental but substantial progress in autonomous vehicles 2019. This year we may also see bigger leaps, such as the first true Level 4 driverless car, if GM stays true to the announcement they made last January that they would start mass producing a steering wheel-less and pedal-less car in 2019. We will be covering many of these and more this year, so stay tuned for an exciting journey ahead.